Christmas backup | Shop Ethical! Don’t be naughty this Christmas, buy nice. Rather than doing your Christmas shopping at the local mega-mart, use gift giving and festive meals to exercise your commitment to ethical shopping. Christmas is an opportunity to shop ethically on a grand scale! The festive meal is an opportunity to share your ethical shopping discoveries with your family. How about a free-range turkey with fresh vegetables from your local farmers market? Perhaps with beer from your favourite microbrewery, or a local organic wine. Actions: Reducing your meat and dairy consumption this Christmas is one of the most effective things you can do to reduce your environmental impact. You may even consider having a vegetarian or vegan Christmas meal. Actions: Most pig and poultry dervied products are factory farmed. Seek free range ham and turkey, chicken and eggs, and ‘accredited free range’ where possible. You might want to choose free-range eggs for that custard on the pudding. See Retailer table below for Free Range produce. Please note: ‘Bred free range‘ piglets are weaned at about 4 weeks and raised indoors in eco shelters. Unlike ‘accredited free range‘, which raise an animal that is free range for all of its life. Choose ‘accredited free range’ where possible. More on the specifics of Animal Welfare labels. Actions: Avoid the following seafood and fish species. Orange Roughy, Tuna, Blue Grenadier, Atlantic Salmon, Striped Marlin, Toothfish, Swordfish, Hake, Oreodory, Skates and rays, Prawns, Sharks. They’re on Greenpeace’s ‘Red list’. Find out why here. Some species considered ‘better buy’ by the Australian Marine Conservation Society Four at the top of this list are Whiting, Bream, Flathead and Calamari. Check out more here.Canned Tuna. It’s the biggest selling seafood item in Australia yet tuna stocks are in a critical condition. If you need to buy tuna, choose Fish4Ever brand that tops the list on Greenpeace’s Canned Tuna guide. 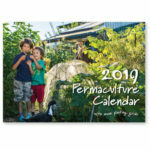 ‘Organic systems recognise that our health is connected to the health of our food and therefore the health of the soil. Organic farmers severely restrict the use of synthetic chemicals, pesticides and fertilisers.’ from Organics-better for the planet, from Shop Ethical! …the Guide. Actions: Have organic vegetables in you dinner but remember, the words ‘orgainc’ in a product label do not guarenttee that farming practice meets any specific crtiteria. Always look for certified produce. Common labels include BFA, ACO, NAASA, Demeter (biodynamic). Actions: Go for ‘fairtrade’ chocolate and coffee this Christmas. It tastes better. Fairly Local – local retailers who supply fairtrade chocolate, coffee and other items. WHERE TO SHOP – THE BIG TWO? 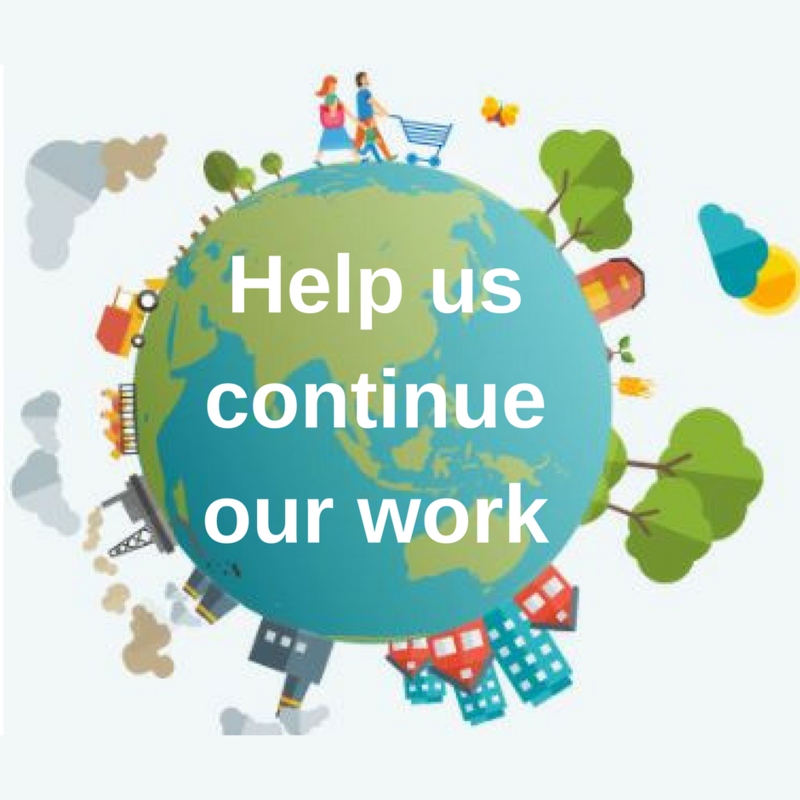 Actions: Look to shop at independent supermarkets such as IGA and Foodworks over Coles and Woolworths if possible, or even better, farmers markets, food co-ops, wholefood stores and independent grocers.When buying alcohol, buy from small retailers and look for independent brands. Woolworths and Coles between them currently control over 50% of total alcohol retail in Australia – up from 32% just 5 years ago. They also own many private label wine brands. Actions: Seek out alternatives closer to home. Ham often comes from Canada, Denmark or the United States, travelling about 15,000kms. (Imports from these countries account for 64 per cent of processed pork consumed in Australia). Living in Melbourne and choosing trout or salmon from Buxton would reduce the travel to 200kms.Make your own dessert using local ingredients. Whether it be a Christmas cake or pudding or the Aussie Pavlova, here’s a chance to source ingredients close to home. Look for ingredients labelled ‘Product of Australia’ first and ‘Made in Australia’ next. ‘Made in Australia from local and imported ingredients’ means it has more local than imported. You might want to make something using fruit that’s in season, or pick your own fruit from a local fruit tree or at a PYO farm. Make your own recipes. Christmas pudding / other Christmas recipes. Actions: Give the little guys a break this Christmas. Support Australian owned local manufacturers and avoid multinationals, especially companies with a negative track record. Use the Guide to find a best buy. So, for example, when looking for soft drinks this Christmas, by choosing Bickford’s over Deep Spring you’re supporting an Australian owned company with a positive track record. See Soft Drinks comparison page. Actions: Avoid food that could be genetically engineered by checking the ‘Greenpeace True Food Guide’ for all brands guaranteed GE-free by their manufacturer . An example could be using Crisco cooking oil over another brand to roast your Christmas dinner vegetables. Actions: Avoid products containing palm oil where possible. See ‘Helping you buy responsibly’ section of the BOS Australia website for products that do not contain palm oil. An example may be when looking for dry biscuits for the Christmas cheese and fruit platter, you may choose Fantastic Snacks seaweed flavoured rice crackers or Roccas Deli Gourmet crackers over others. Actions: Don’t forget to take your reusable shopping bag. Buy in bulk to minimise packaging waste.Doing a picnic in the park? BYO plates and cutlery or use biodegradable plant-based items, available from Going Green Solutions. Actions: When buying beer, support one of Australia’s 100+ microbreweries. With exception of the family owned Coopers Brewery, all of the large Australian breweries are now owned by either the Foster’s Group (bought by UK’s SAB Miller in 2011) or Lion Nathan (owned by Japan’s Kirin). See Beer company comparion page. Overindulgence is often the hallmark of the day. Many of us are familiar with those “I gotta-lie-down” moments after dinner. ‘There are two ways to get enough. One is to continue to accumulate more and more. The other is to desire less. — GK Chesterton.’ from Shop Ethical! …the Guide . Action : Try to plan your meal appropriately for the number of people eating to avoid the mountains of food waste. Compost the waste. If you haven’t got a system, now may be the time to add one to your wish list. It’s important that we ask ourselves why we celebrate at Christmas in the way we do. This includes our motivation for gift giving. What makes an ideal Christmas gift? Something the recipient likes? Something you like? Something that is useful? Something that is meaningful? Something that isn’t disposable? The perfect gift is likely a combination of all these things. There are different ways of doing gifts. Some require some time, energy and creativity. Others directly contribute to a positive environmental and social outcome. 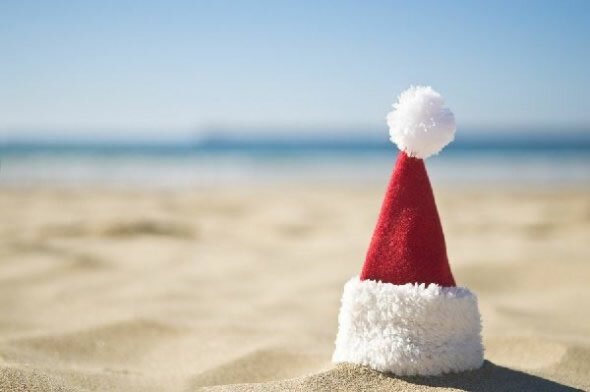 Where possible, plan your Christmas. That way you will avoid impulse buying those last minute gifts which are often discarded after a few days.Below we’ve listed some issues connected to your gifts and some examples of ‘good buys’. Start by asking what your friends and family value. What will be an enjoyable, meaningful or appreciated gift for them. What may help them on the journey towards a more sustainable and intentional way of living.You will find more ideas by searching the links for ideas here. 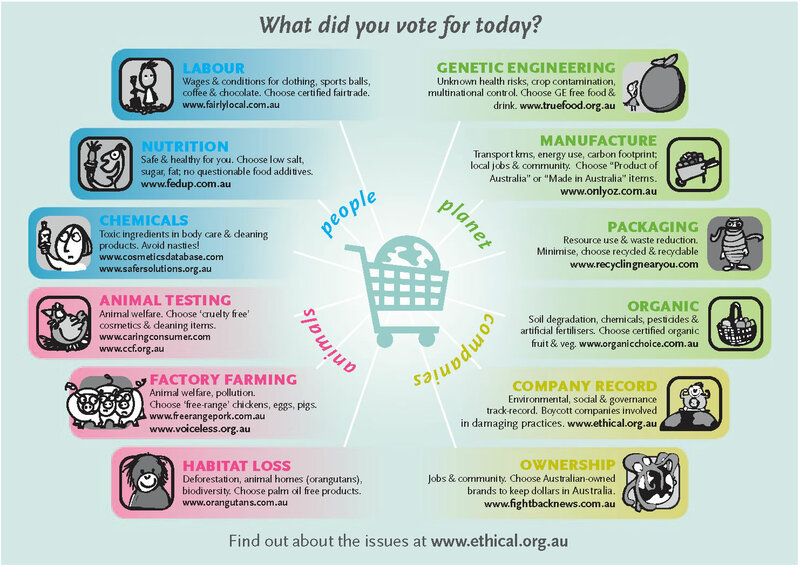 Actions: Choose Australian made toys, available at websites such as playtolearn.com.au, ecotoys.com.au, entropy.com.au. Choose ‘China-free’ toys from companies such as Playmobil and Lego who manufacture most of their products in Europe. Check the company track-record for toy manufacturers and avoid those with significant criticisms.Toys last a lot longer than kids’ interest in them so keep them moving around. Tell everyone you’re happy to get hand-me-downs as presents. Seek out used toy in good condition on your local Freecycle, fairs, or online.sites such as ebay. Resources: See more issues relating to toys in Choice’s toy industry survey article (2008). Give a home-made voucher to exchange for your time – cook a meal, do the garden, create a home compost or veggie garden, look after the kids, give a massage. Make something yummy. For all those who can bake. Make something crafty. For all those who can knit, sew, spin, pot. 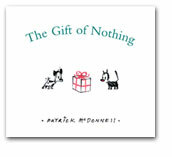 The Gift of Nothing. A very cool book. Mooch the cat desperately wants to find a gift for his friend Earl the dog, but Earl already has everything. “What do you give a guy who has everything?” Mooch wonders. The answer, of course, is nothing! Available online. Buy less. If your family is up for it, do a a Kris Kringle — where each person only buys one present each. Choose who you give to via names out of a hat and set a limit for how much you have to spend. Check out our Top Ethical Gift ideas. Also the extremely good ‘Peak Oil Gift Buying Guide‘, with a funny gallery by artist Jonathan Plotkin. It’s American but has some great ideas. Below are further examples of ‘good’ buys. People friendlyFairtrade – fair wages, no exploitation. 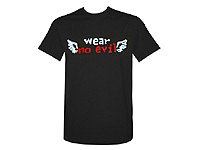 Etiko Fairtrade T-shirts “Love Revolutions ” “Wear no Evil”. Some people are weighed down with stuff. Others don’t have the essential stuff they need. Buy a goat for your mum. Enviro Toothbrush. Made from Bamboo, totally biodegradable. From Go Green at Home. See Green Collect Upcycled products, including bags, cushions, note & journal books. Handmade in Melbourne from discarded materials & clothing. Made by the African Women’s Sewing Group and residents at Common Ground (people previously experiencing long-term homelessness), both training and employment initatives of Green Collect. Soap Nuts – natural, toxic- free, waste-free laundry detergent alternative. Go Green at Home. Wozwaste. Bags made from inner tube, toothpaste tube, snack food packaging. Knowledge to Action Equip your gift recipients with the ‘know-how’ of how to live well. Further explore the ethical and environmental implications of your food choices. By Angela Crocombe. From shop. Local food advocate Sarah Robins journeys across Victoria, introducing you to the varied and vibrant people who put food on our table. With more than 80 seasonal recipes. From shop. See more books relating to sustainability, justice and ethical lifestyle. Get the guide. Great useful Christmas stocking items. Discounts for bulk orders. More Sustinable Christmas ideas from Baptist World Aid. Don’t go for disposable – keep them to last for years to come. Tinsel and trinkets – make your own .Try edible decorations of dried fruit or popcorn on a string. Popular with the kids. Decorations with an ethical edge. Turn off lights when not being viewed. Look for products using LEDs instead of traditional bulbs – they last 10 times longer and dramatically reduce power use. TREESThere are lots of options to the plastic tree (made from PVC – toxic when recycled) or non-native pine which is grow in grown in dense monoculture plantations that require high inputs of chemicals and water. The Australian Black Pine (right) is drought tolerant, looks good all year round, doesn’t mind life in a pot, and make a great Christmas tree. This pocket-sized guide will help you avoid naughty companies and support nice ones all year round. Over 120,000 copies sold! Ask Santa to slip one in your stocking this Christmas. Do it differently this Christmas! I buy. I wrap. I give. I get. I get caught up. It’s easy to become lost up in the busyness, anxiety and the frenzy of over-consumption at Christmas time. So how do we reclaim the essence of Christmas? One that reframes relationships as being more important than possessions and quality time more significant than the rush. One that recognises that all our purchasing choices are connected to wider issues in the world and there is a story behind all the things we buy and receive. This guide explores some things you can do to make a difference with the way you celebrate this Christmas. There are many positive choices you can make for the health of the planet, your community, and yourself. It may be buying a ham that hasn’t travelled halfway around the globe to get to you, or choosing a non-factory farmed turkey. Perhaps you could choose coffee where the owner of the company has guaranteed a fair wage to the plantation workers, or seafood that has been fished in a sustainable manner. You can also avoid companies with a negative track record, and find good gift alternatives that minimise waste. 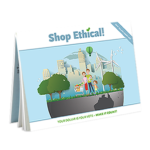 This Christmas guide is designed as a companion to our Shop Ethical – the guide to Ethical Supermarket Shopping print guide and referenced throughout with links to the www.ethical.org.au website. We recommend you grab some print copies of our supermarket guide to give to friends and family this Christmas. It’s a good way of speading the message and equiping people to make a difference in the preparation for Christmas. All the best in having a great day and making it count this Christmas.